What sort of iPad 2 would do it for you? With the iPad 2 due in April – probably only initially in the USA – the rumour mill has well and truly begun on what the next-gen iPad’s new features will be. The retina display as used in the iPhone 4? 3-axis gyroscope, also as used in the iPhone 4? Front and back camera, so it can be used for the Apple FaceTime video calling? Will it be have more storage? That little collection is the common guesses on what the iPad 2 will have added. A choice of more than one colour? A giant 80s inspired beatbox version? Will it have a Dyson Air Multiplier built around the edge, and work both as a tablet computer and a cooling fan? None of this second last ones are serious, which brings me to the point of this post, which is to serve as the entry point for a competition for followers of the TechStyles Facebook page ONLY. 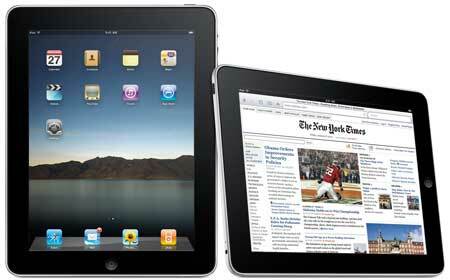 So TechStyles Facebookers, what would YOU like to see as a new feature, or indeed features on the iPad 2? You could provide a serious answer, a ridiculous answer. Have a think, and place your answer to the question in the ‘Leave a Reply’ section below. Answer in 100 words or less, and be sure that the name you place with your comment matches your name on your Facebook profile. The competition closes at midnight, 28 January, 2011. I repeat, the competition is for followers of the TechStyles Facebook page only, who are Australian residents. Next ArticleOlive O3HD Music Server – plug, rip, dance. Easy. I would like it to be dustproof, waterproof, small-boyproof, small- and large-dogproof. It would need to have Mx versus Atv unleashed built in along with Sims 3 and Spore as my three boys love those three games. It would have to have attachments so three players could use it at once to prevent sibling wrestling sessions in the car on long journeys to motocross races. To be perfect it would need to be a camera, videocameras, phone, computer and drink tray all in one. Good and comprehensive answer Chauntelle, but I’m afraid this competition closed at midnight last night. Connectivity! Imagine integrating it into the whole house! It could be the universal remote. While one person is watching TV it could serve as a second screen for someone else, also displaying an interactive TV guide previewing shows before updating the main TV. It could act as a second PC screen allowing you to access and use your PC from another room. Interacting with the house climate controls from the iPad 2 would also be great as well. Along with all the games and online capabilities it already has, this would create one essential piece of electronic gear! you can add more accessories to your iPad. It will have a front-facing camera that opens up a whole new world for business users of the iPad you will be able to choose different carriers will be able to handle larger and more functional apps that what we have seen currently will also be a back-facing camera then it’s quite possible you will be able to do better photo and video editing. It will have new screen technology that is better with glare. This, coupled with a new design, would make it easier to read on the iPad 2. The ability to switch off the back-lit screen so it can also function like an e-ink ebook reader, especially outdoors in the sun. Given the choice between a Kindle and an iPad 2 with that ability, I know which one I’d want. Waterproof and indestructable under any water related conditions including but not limited to coffee spills, other thrills like having one too many drinks that spill, fishing trips, washing machines spins, scuba diving while wearing your fins. I’m lucky to have an iPad, it simply is Woohoo! But alas, there are things missing, I’d like to name a few. A bubble gum dispenser, for when surfing, I like to chew. And I don’t want to chew my ‘Apple’, ‘twould be an uncomfortable trip to the loo! My kitten likes to play, she really does get bored! So give me a pussycat toy attachment either side, to prevent me from getting clawed! A mini bar on-board, or a syphon connector at least. With remote control for the toaster! Now that ya couldn’t beat! I would like that the fingerprints don’t show all the time. I get sick of cleaning the screen. Priced competively within the Australian market, that we do not have to wait months to get, more slimlined, and, has a better colour selection around the iPad’s edge. A better anti-theft device would also be a good idea (voice activated password protection (? ), and hopefully, more reasonably priced applications. I would also like my iPad to have holographic projection capability. I do not own an iPad, but if I did it would have heaps of memory, it would have its own built-in photo albums so that all photos get automatically placed in the photo album when a photo has been taken, it would have software built-in that allows editing of video/photos plus way to send straight to printer. The iPad would have interchangable covers so that I can choose my colour and style daily. A place to put games discs IE DS or PSP discs in it. A big screen with a pullout keypad as a bonus. A world breaking new feature for the iPad 2, something no one could imagine but would offer their souls for… a transmat beam! Ditch the planes, crash the cars, burn the buses and bomb the trains. Buy the new iPad 2 and travel the globe AND outer space via your new gadget… count me in! What I would love in the new iPad 2? Well I really can’t say as I don’t have an iPad, but with the technology moving on I’m hoping it will bring a better price on the original Ipad. I do have an iPhone. So what would I think I would like in the iPad 2, is for it to be a lot more robust. I don’t see the point in having all the technology at your fingertips if you’re too scared to use it. I have seen many people wrap it in cotton wool and only use it ‘sometimes’… what’s the point?